Border crossings are like legends. Travelers circulate tips, advice and helpful hints amongst each other in the hopes that they will spare another from the experience they had. For us, border crossing days were stressful — we felt our most vulnerable with passports in hand, cash in pockets and at our most vigilant against scams, cons and thieves, who always appear at their most intimidating at border crossings. So here’s our round up, after 50 countries, the good, bad and ugly of our border crossings. 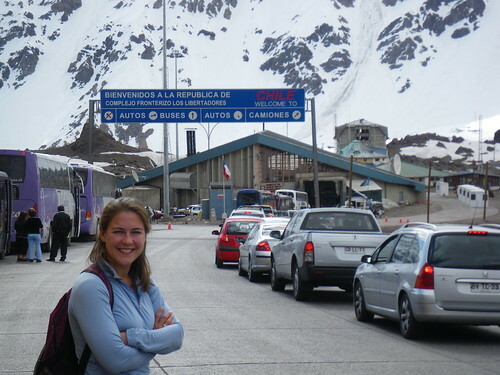 It took us six hours to cross from Argentina to Chile. I’m not joking, we literally left Mendoza, arrived quickly at the border and waited. And waited, and waited. We watched two movies on the bus, we got off, walked around, read, entertained ourselves, went for food, came back, read some more, it was a never ending wait to cross the border. The scenery was lovely, but had I known we’d spend the whole day waiting in line I would have gone for a hike! We weren’t able to contact our couchsurfing friends who were waiting to pick us up in Santiago, so when we got off the bus at nearly 11pm, we were anxious about finding them and/or finding a place to sleep. By the time we got a SIM card, loaded it and made the call it was nearly midnight. Unable to reach them our anxiety level increased until from across the bus station they called out to us! Serendipity! As you can tell it was a rough couple of weeks in Central Asia. We spent only two nights in Almaty when we realized we had to get out of Kazakhstan. The regulations were unclear as to whether we had to register. By our understanding we were already registered, having flow in and gotten our visas in the U.S. Everyone else told us we were wrong, and after pushing and shoving at immigration in Almaty, we determined they were right. With not enough time to process our registration before we would face a penalty, we booked a ticket to China and basically fled. Arriving at the Kazakhstan border, we held our breath and quickly passed through customs. China was another story. Relieved and excited, we arrived at the Chinese border post amazing at the organization and the English signage. After charades and lengthy discussions with the immigration agent, we were searched and our laptop and my passport were taken from me. Immediately I made a big to-do, mostly because I didn’t like my passport out of my sight. I refused to go through the last security checkpoint without my passport or computer and eventually after complaining to everyone I saw, my passport and laptop were returned. The whole situation was uncomfortable. It was the first and only time my passport left my possession, albeit unwillingly, and I was incredibly fearful. Up at 4:30 am to catch a 5:30 am bus from Quepos to San Isidro. If we missed the first bus, no getting to Panama in time to kayak the next day. Costa Rica immigration was easy, we got our exit stamp – no fees – and continued on our way. 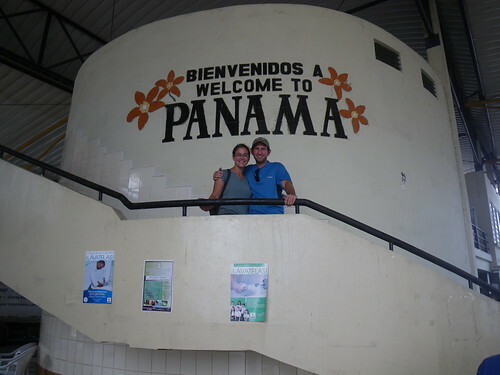 Upon reaching Panamanian immigration we were accosted, truly that is the only word to describe it. One man grabbed my passport, put in a sticker and demanded $1. No explanation. The immigration official on the other side of the glass, who had Jillian’s passport merely nodded and told her she needed the same. Another ayudante (helper in spanish, but they generally are anything but) grabbed my hand and told me I needed to go to the tourism office. There we were provided tourists cards and asked for $5 each, the fee we had expected to pay, and were told that we did need to give this other man a dollar for the sticker in our passport. Pushed back out the door to immigration we stood in line waiting to get our passports stamped. Next up, Customs. Lets keep in mind that we’d been up since 3:30 a.m (time change!) and hadn’t eaten. Pulling our bags back to the bus we got more than a few sympathy looks from our fellow passengers and continued on our way.